Electricity generated through coal plants is becoming expensive by every passing day. Power cuts and increasing dependence on DG sets is causing a lot of damage to the environment. The demand supply gap for electricity is increasing in the country which makes it very important for people to start thinking of other ways of realizing their energy needs. Keeping this in mind Ministry of New and Renewable Energy (MNRE), Government of India is promoting off-grid solar PV systems under the Jawaharlal Nehru National Solar Mission in the country. Many people in the country have started feeling the need of installing solar PV system for their home, apartment complex or small office use, and with this article we would try to provide some information which can be a good starting point for a roof-top Solar PV system project. What is a Solar PV cell and module? Solar PV cell is the basic building block of a PV system. It consists of semiconductor material that absorbs sunlight to generate electricity through a phenomenon called “photoelectric effect”. Only sunlight of a certain wavelength can effectively generate electricity. Although a solar PV can generate electricity on a cloudy day, but it is not as effective as it is on a sunny day. A basic PV cell produces a very small amount of electricity and multiple of them are connected together to form a Solar PV module that can generate 10W to 300W output. If more electricity is required, them multiple such PV modules have to be installed in an array. Roof Area Needed in Sq. Ft. Solar home lighting systems approved under NSM (National Solar Mission) are required to have a certain level of efficiency. The CFL based solar systems are required to have module efficiency of 14% and above and a LED based solar system is required to have module efficiency of 12% and above. Please note that such systems will have a serial number starting with NSM engraved on the frame. Before you buy a system, it is very important to size your solar system properly. Sizing will depend on the load requirements in your setup. It is important to note that a Solar system is good for operating low wattage appliances like lights, fans, TV, etc. High wattage appliances like Air Conditioners and Water Heaters cannot be operated using solar PV system (in fact solar water heaters and solar air conditioners are available separately). It is very important to make sure that your system is energy efficient so that you do need a bigger sized solar system. Please read our previous article: Before Renewables think Energy Efficiency. The connected load of your setup will help you determine the size of system that you need and that in turn will drive the cost of the system. The load carrying capacity of the roof where the solar panels are to be installed should also be done. Solar Panel structure typically weight 15kg per sq meter and the roof should be able to handle the load. Tilt at which the solar panel is installed is also an important consideration. It is important that the tilt of the solar panel is the same as the latitude of your location. So typically a 1kW capacity solar system will generate 1600-1700 kWH of electricity per year (please note that this is just a thumb rule as the CUF will vary in different cities in India). A typical Roof Top PV system also contains a set of batteries and inverter along with the modules of Solar PV cells. The overall efficiency of the system will also depend on the type of battery and inverter used in the system. It is important to choose the right components for most effective use of Solar PV systems. “Deep Cycle” batteries (generally lead-acid) are the best suited for a solar PV system. They last for 5 to 10 years and are 80% efficient (can reclaim 80% of energy stored in it). These batteries are also designed to provide electricity for long periods and can discharge up to 80% of their capacity repeatedly. Automotive batteries that are shallow cycle should not be used. Sealed maintenance free or tubular positive plate batteries are good for Solar PV systems. It is important to size the batteries properly so that they can store sufficient power based on your needs during cloudy weather. Batteries should be located in a space that is easy to reach (for maintenance), well-ventilated and protected from extreme weather. Even inverters are not 100% efficient and it is important to choose the right inverter that is at least 85% efficient (If a system is purchased under National Solar Mission then these standards are guaranteed). A modified sine wave or a pure sine wave inverter is better suited for a solar PV system. Modified sine wave inverters are cheap but less efficient. They waste some electricity in form of heat. They create a buzz sound with appliances and thus should be used only with low-end appliances. Pure sine wave inverters are most efficient but are expensive. They are good for all kinds of appliances. If purchased under NSM a Solar PV module comes with a warranty of 25 years from the date of supply. A solar home lighting system (with inverter) comes with a warranty of 5 years and the batteries if sealed maintenance free come with 2 years warranty and lead acid flooded type battery comes with 5 year warranty. It is important that the manufacturers provide an operation, instruction and maintenance manual in English and local language along with the system. As with all electrical and mechanical system, solar PV system also needs regular maintenance. An efficient long lasting system is one that is maintained properly and regularly. A solar PV system does not require a lot of maintenance but it is good to clean the system of dust and bird droppings regularly to maintain its efficiency. If you choose a maintenance free battery then you need not worry about the battery, else the battery will need regular maintenance. Make sure that the system is getting adequate sunlight and is not getting shaded by nearby trees, etc. As per our resources from the solar PV industry, cost of a PV module (just the panel) costs anywhere between Rs 30 to Rs 50 per watt of power generated. A good imported module will cost around Rs 40 per watt. Good ones manufactured in India would come as low as Rs 30-32 per watt. Please note that this is the cost for the panel and in case you are looking for inverter and batteries, the cost would be additional. 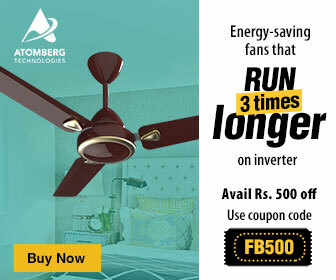 A good 5 kW system for a home would cost around Rs 3-4 lakhs to setup, which can provide electricity for 25 years. The additional operating cost will include the cost of replacing the batteries.